Home Biblical Christian Articles Winds of Doctrine Jerusalem: Key to End of Days? Jerusalem is a fascinating site of historical significance. They are tourists and view Jerusalem as a tourist would. 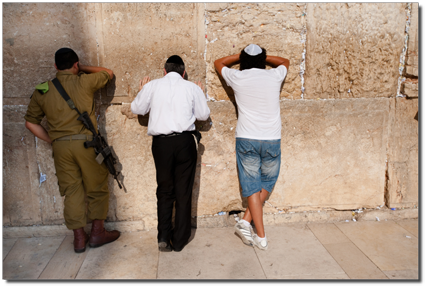 Jerusalem is a site that is central to their religious beliefs. Devout Christians visit Jerusalem because they want to “walk where Jesus walked and feel His presence there.” Devout Muslims wish to visit Mohammed’s “Far Mosque” referred to in Sura 17, traditionally held to be in Jerusalem. Jerusalem is pivotal to the fulfillment of their traditional apocalyptic expectations. It is the oldest of the three great monotheistic religions. Judaism’s view of history, as rendered in the Torah some 2,600 years ago, provided a basis for Christianity and, later, Islam. The Israeli leader Moses, who received the Lord’s laws atop Mount Sinai . . . is a revered prophet in all three faiths. In Israel, 2,000 years ago, a child was born to a Jewish couple. 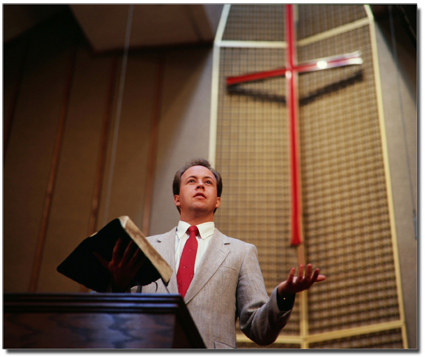 Jesus grew to be a charismatic preacher, gathering disciples as he went. This Son of God performed miracles, they said . . . Jerusalem’s authorities, perceiving a threat, had Jesus executed. His followers, taking up the cross, built the world’s largest religion in his name. Believe in one supreme Creator Deity. Accept the Old Testament as a holy book. Claim that the Messiah/Saviour/Mahdi of the other two is anti-Christ. Want a theocratic dictatorship ruled by their Messiah/Saviour/Mahdi. Have apocalyptic expectations centering on Jerusalem to establish a theocratic dictatorship. Believe that the prophesied end-time destruction can only be survived by their religion being uppermost. In addition to these similarities, significant numbers of all three religions either teach or act on the concept of Convert or Die! Islam has killed multitudes for refusing to convert to their religion. Roman Catholics may present a fair face to the word today, but her doctrines have not changed. The Roman Catholic Church is responsible for the deaths of even more people than Islam. 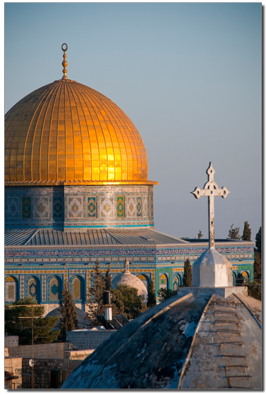 Jerusalem is central to the apocalyptic expectations of the world's three largest religions. While the ongoing acts of violence committed by Palestinians against Israelis frequently make the news headlines, the many instances of innocent Palestinians, American civilians and many others baited and antagonized by Israeli troops, and even killed outright, rarely if ever make the news. Yet such atrocities by Israelis against the Palestinians and others are an on-going reality. Careful research by many different scholars has exposed the Zionist agenda behind innumerable wars, including collusion with the Nazis during World War II.Taken all together, an alarming picture begins to emerge of an all-out war for theocratic dictatorship leading to worldwide control, at the cost of annihilation of all other religions. During the last twenty years, there has been an increase in war rhetoric by various leading Imams urging their believers to jihad. The expectation of the coming of the Mahdi requires cooperation on the part of believers to prepare for his coming. 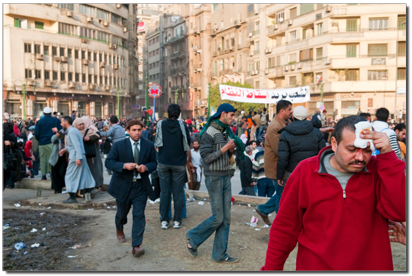 Muslims are divided into two groups, depending upon their apocalyptic expectation. Some Muslims believe that turmoil and fighting in the Middle East prepares the way for the Mahdi to come and lead their armies to victory. They will capture Jerusalem for Islam and once it has been conquered, the Mahdi will lead them in victory over the rest of the world. Other Muslims believe that as soon as they are in complete control of Jerusalem, then the Mahdi will be occulted (appear) and lead them to conquer the rest of the world for Islam. The significance of Ahmadinejad’s comments become clear once the link to Jerusalem is understood. prepares the way for the arrival of the Mahdi. While one group of Muslims believe they must first gain control of Jerusalem before the Mahdi comes, the other believes the Mahdi will come first and help them capture Jerusalem – all this is but the precursor to total Islamic world dominance. 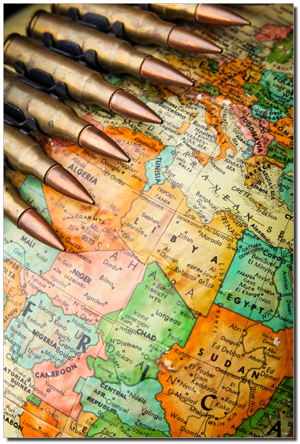 Both groups view turmoil in the Middle East as a positive development which advances their agenda for the Mahdi’s arrival. This should be a warning to every non-Muslim, particularly in light of comments made recently by Louis Farrakhan, head of the Nation of Islam. In his keynote address delivered on February 27, 2011, at the Nation of Islam’s annual Saviour’s Day event, Farrakhan told a capacity crowd of 16,000+ people that the recent rioting in the Middle East was evidence that the Mahdi has, in fact, returned. Featuring just as centrally in Jewish apocalyptic expectations, Jerusalem is also crucial to Jewish/Zionist plans for world dominion. The prerequisite to the glorious future envisioned by Judaism is the rebuilding of their temple and a king, of the lineage of David, sitting upon the throne in Jerusalem. It is not a handful of visionaries only, but leading and influential (and well-funded) men who are preparing to rebuild the third Temple when given the opportunity. One such person is Rabbi Chaim Richman of the Temple Institute. It should be understood that just as Muslims are divided into various categories, so are the people commonly referred to as “Jews.” Some of these people are true descendents of Abraham, having Hebrew/Israelite blood. Many of them, however, have no blood connection to Israel at all. They are descendents of the Khazarian nation which ruled in Central Asia centuries ago. 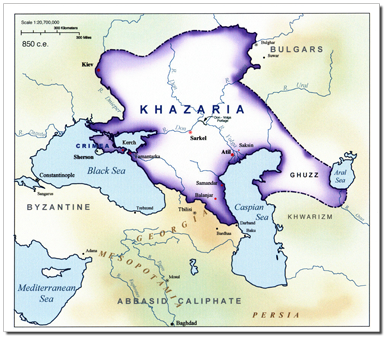 The Khazars were a Pagan civilization, and in a short period in history, became the largest and most powerful kingdom in Europe, and possibly the wealthiest also. They brought with them their religious worship that was a mix of phallic worship and other forms of idolatrous worship practiced in Asia by other Pagan nations. This form of Pagan worship continued into the seventh century with vile forms of sexual excesses and lewdness indulged in by the Khazars as part of their religious beliefs. In the seventh century A.D., the Khazarian ruler, King Bulan decided to convert his people to one of three possibilities: Judaism, Christianity, or Islam. After an historic session with representatives from the three monotheistic religions, King Bulan decided to adopt "Talmudism", (as it was known then and practiced today as Judaism,) over Islam and Christianity and [Judaism] became the new state religion. King Bulan and his four thousand feudal nobles were promptly converted by rabbis imported from Babylonia for the event. Phallic worship and all other forms of idol worship were there after forbidden. The Khazarian Kings invited large numbers of Rabbis from Babylon and vacinity, to come and open synagogues and schools to instruct the population in the new state religion. Khazarian Empire at the height of its power. Because the Khazars had no written language, the now self-styled “Jews” used Hebrew characters to put the sounds of their mother tongue into writing. It has come down to modern days as Yiddish. While shocking to many people who assume that “Jews” are the blood-descendants of Abraham, the Khazar-Jews themselves know the truth of their history. Harold Wallace Rosenthal, a Jew, was a senior aide to then-United States Senator, Jacob K. Javits, another Jew. In 1976, Rosenthal gave an interview in which he boastingly revealed the Jewish/Zionist agenda at work in the world today. Gloating at the stupidity of the American goyim who were mere pawns of the Jews, Rosenthal stated: “It is a marvel that the American people do not rise up and drive every Jew out of this country." The interviewer, Weisman, was so appalled at what he was hearing from Rosenthal that at one point he felt compelled to protest. Weisman: “According to the latest scholarly research, your ancestors are not Israelites but Mongolians and Asians from Eastern Europe and Western Asia so your ancestors were thousands of miles from the Holy Land. They never ever saw the Holy Land proving that your people were not the chosen people of God." Rosenthal: "So what? What difference does it make?" Weisman: "We have been taught the big lie for many years that Jews are God's chosen people so it does make a difference. A very grave difference." Rosenthal: [shouting very loudly] "What the h*** of difference does it make now?" It is hardly surprising that the young, rising political star, Howard W. Rosenthal, was murdered under questionable circumstances a few months later. The goal of Khazarian-Zionist-Jews is world dominion via their claimed descent from Abraham. Admittedly, people of Israelite descent have the strongest claim to Jerusalem. Thus, by cloaking their ambitions for world dominion under an assumed Israelite connection, Khazarian-Zionist-Jews have the strongest claim to Jerusalem. Many Christians are unwitting helpers in furthering the Zionist agenda for world dominance. The fondest hope of all Christians, the promise to which they have clung for nearly 2,000 years is that one day the Saviour would return to earth. Large segments of Christianity also believe that Jerusalem plays a momentous role in the last days of earth’s history before the Second Coming of Jesus Christ. Like the Jews, these people believe that the temple must be rebuilt before the Second Coming. They also look for a return to Israel of the “Jews” (whom they assume are Israelites by blood). For this reason, many Christians are supportive of Israel as an independent state. An independent Jewish State is necessary to fulfill their apocalyptic expectations. The Jews are only too happy to accept the help of Christians when such help is in line with their own goals. What many overlook is that the Christians believe that the Mosaic law was done-away with at the cross. Nevertheless, they continue to cooperate with the Zionist/Jewish goal of Temple restoration because of their beliefs that the Jews as a whole will be converted to Christianity during a seven-year tribulation just before the Second Coming of Jesus. To render Mosaic law redundant is to negate all the learning of the rabbis and the value of everything that they believe and teach. The only conclusion one can draw is that the continued acceptance of support from Christian fundamentalists by these Orthodox rabbis who wish to rebuild the Temple is an act of breathtaking cynicism. For the Christian fundamentalist groups to continue to give their support is an act of naïveté, equally breathtaking. What both groups are choosing to ignore is that the Christians are intent upon converting all the Jews to an acceptance of Christ as the Messiah at the end times. In the minds of these fundamentalist Christians, those Jews who do not accept this will unfortunately die. . . .
Just as Muslims are divided into two camps by their different beliefs regarding the timing of the Mahdi’s appearance, just as “Jews” are divided into those who are blood descendents of Abraham and those who are of Khazarian blood only claiming to be blood descendents, so Christians who look to Jerusalem for the fulfillment of their apocalyptic expectations are also divided based on their own belief structures or personal agendas. 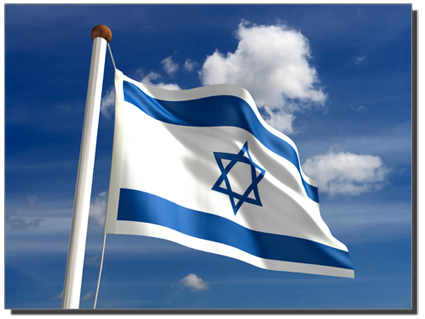 Evangelical Protestants are some of the most out-spoken in support of Israel as an independent state. They give sacrificially to the support of Israel and look for the rebuilding of the Temple as a fulfillment of prophecy. Israel Re-Born May 15, 1948, and Temple to be rebuilt (Sanhedrin reorganized on Jan. 12, 2005, and the Temple is their 1st priority). Jews of various ancestries return to Israel. Preachers take Old Testament promises given to ancient Israel and apply them to modern Israel. Many of the texts which have a future application to the New Earth after the Second Coming are also taken out of context to apply to modern Israel. What multitudes of sincere people are overlooking in their efforts to “bless” the nation of Israel so that they, in turn, will be blessed, is the fact that all of Yahuwah’s promises are given on condition of obedience. Just as the Israelites of Christ’s day took Scriptures that pointed to His Second Coming and applied them to His First Coming, so many sincere people today take Scriptures which apply to the Earth made new and eternity future and reapply it to modern Israel. The very fact that Jerusalem was utterly destroyed and its people scattered in A.D. 70 is convincing evidence that the long-suffering of Yahuwah was finally exhausted in the continued hard-hearted, “stiff-necked” rebellions of the Israelites. The apostle, Paul, emphatically rejected the exclusive mindset of the Israelites of his day which maintained that the promises were not for anyone but Israel. While Paul kept the true Sabbath and all the annual feasts, he wrote extensively against the continued practice of circumcision as that was a part of the Old Covenant of blood-sacrifices that were fulfilled at the cross. Because of this, many who promote a return of the “Jews” to Jerusalem and who believe that the Temple must be rebuilt in order for Jesus to come, have rejected the writings of Paul. It is claimed that Paul taught “another gospel” and he is an anti-christ. Another false expectation widely taught but without Biblical support is the theory of the Rapture. This belief holds that the Saviour will come secretly and “rapture” His chosen ones out of the world to save them from seven years of Tribulation. This is known as the pre-Tribulation rapture. It is during the seven years of great tribulation that they expect all of the Jews to be converted and accept Jesus Christ as the true Messiah. At the end of the seven years, they, with Christ, will return triumphantly to earth to reign for 1,000 years of peace. Here is the key to Evangelical support of Zionism. They give liberally because they believe in the final conversion of all the Jews. The pope has always wanted Jerusalem. The Crusades resulted in the merciless slaughter of multitudes of Muslims, Hebrews and apostolic Christians. Their sole purpose was to capture Jerusalem for the pope so that he could reign from there. (The papacy is moving ever closer to achieving this goal: A Seat for the Pope at King David's Tomb) The Holy See has always longed for total world dominance. 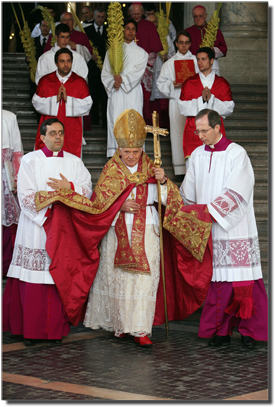 Following Vatican II in the 1960s, the papacy began courting other Christian churches. The efforts to unite with these “separated brethren” were so successful that there have been numerous “conversions” by various Protestants, including Episcopalian priests, to Catholicism. While the Seventh-day Adventist Church publishes books calling the pope the “man of sin” and stating, “It is a backsliding church that lessens the distance between itself and the Papacy”21 they also have made concessions to Catholicism that were unimaginable by the founding fathers of their faith. John Paul II, who was elected pope in 1978, made more international trips than any previous pope. These trips were for the express purpose of reconciling the Holy See with her “separated brethren.” His efforts were so successful that in 1994 a land-mark document was signed entitled, Evangelicals and Catholics Together: The Christian Mission In The Third Millennium.22 An even more surprising victory came when leaders of the Russian and Greek Orthodox patriarchate made certain concessions to the Holy See. 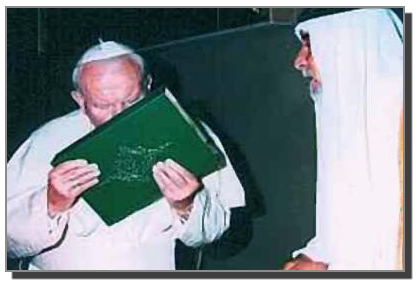 Pope John Paul II arrived in Israel March 21, 2000, for a historic five-day visit, during which he visited the holy sites of the three major religions and met with Israel’s political leaders and Chief Rabbis. Though ostensibly a trip focused on religion, the Pope also touched on political issues, blessing Israel, expressing support for a Palestinian homeland and apologizing for sins committed by Christians against Jews. In a meeting with President Ezer Weizman on March 23, the Pope blessed Israel, an act seen by many Israelis as final church recognition of their state. For centuries, the Catholic Church taught that the Jews' exile was punishment for the death of Jesus. . . . The current pope, Benedict XVI, has continued in the footsteps of his predecessor. 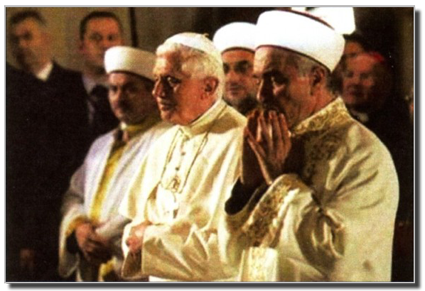 On November 20, 2006, the pope prayed in a Muslim mosque. Pope Benedict, in a new book, has personally exonerated Jews of allegations they were responsible for Jesus Christ's death, repudiating the concept of collective guilt that has haunted Christian-Jewish relations for centuries. The all-important goal driving the Roman Catholic Church’s desire for ecumenism is the desire to rule the world from Jerusalem. The belief that Jerusalem is crucial to the fulfillment of apocalyptic prophecies is one of Satan’s largest and most successful lies. Its seriousness is found in the fact that it embrace’s the world’s three largest religions. Each religion, and each division within that religion, has a variation of the lie tailor-made for it by the Prince of Lies (Lucifer) himself. The principles of Satan’s kingdom are two-fold: 1) falsehood and, when that fails, 2) force. All three of the world’s main Abrahamic religions have been guilty of using both principles for the purpose of gaining greater power and control over the masses. Any belief that promotes Jerusalem, that calls for a return to that specific piece of real estate, that solicits funds for the rebuilding of a temple in Jerusalem, is a deception that has been planned by Satan himself to either unite the religions of the world under one umbrella or, conversely, to “divide and conquer” those who refuse to unite. When Yahushua was on earth, His followers were looking for precisely what is now being promised in this end-time delusion: Israel as a world-dominant power, crushing all of her enemies. The priests and rulers of Yahushua’s day first sought Him in hopes that He would lead the Israelites to victory over the hated Romans. They quickly rejected Him when they realized that He had no such intentions. Yahushua clearly taught that His kingdom was a spiritual kingdom. This divinely spoken truth was anathema to the Israelites! Faced with the destruction of their ambitious hopes for world dominance, they quickly rejected their long-awaited Messiah. Using their own ambitions as a weapon against Him, they accused Him before Pilate of being engaged in seditious and rebellious behavior against Rome. However, when Pilate asked Yahushua if the charges were true, the Saviour again reaffirmed that His was a spiritual kingdom. Then Pilate entered into the judgment hall again, and called Yahushua, and said unto him, Art thou the King of the Jews [Israelites]? . . . Thine own nation and the chief priests have delivered thee unto me: what hast thou done? Yahushua answered, My kingdom is not of this world: if my kingdom were of this world, then would my servants fight, that I should not be delivered to the Jews [Israelites]: but now is my kingdom not from hence. All who will accept the truths of the Bible will realize that the Saviour’s kingdom is still a spiritual kingdom. The promises of Yahuwah to literal Israel will be fulfilled to spiritual Israel. This does not occur at any point in time before the Second Coming. Only after the destruction of the wicked, when a New Heaven and a New Earth are created, will these promises reach their ultimate fulfillment to spiritual Israel – those who, by obedience, have met the required condition of fulfillment, which is obedience to the divine law. Divine Love has provided a glimpse into this glorious future in the last book of the Bible. In the earth made new, populated by those who have overcome by the blood of the Lamb; those who, through faith in the atoning merits of the blood of Yahushua have perfectly kept the divine law, every gracious promise given to the obedient will be fulfilled. 1 Holy Lands: One Place, Three Faiths, LIFE, pp. 2-6. 2 Patrick Poole, “Ahmadinejad’s Apocalyptic Faith,” FrontPageMagazine.com, August 17, 2006; John Daniszzewski, “Messianic Fervor Grows Among Iran’s Shiites,” Los Angeles Times, April 15, 2006; Scott Peterson, “Waiting for the Rapture in Iran,” Christian Science Monitor, December 21, 2005; Jackson Diehl, “In Iran, Apocalypse vs. Reform,” Washington Post, May 11, 2006; Dore Gold, The Fight for Jerusalem, 2007, p. 232. 3 Address by President Mahmoud Ahmadinejad, president of the Islamic Republic of Iran, before the UN General Assembly, sixtieth session, September 7, 2005, www.un.org. 5 Dore Gold, op. cit., p. 233, emphasis supplied. 7 Aryeh Kaplan, Jerusalem, The Eye of the Universe, (New York: National Congress of Synagoge Youth, 1976), 76. 8 Michael Baigent, Racing Toward Armageddon: The Three Great Religions and the Plot to End the World, pp. 218-219. 9 Baigent, op. cit., pp. 18-19. 11 Joye Jeffries Pugh, Eden, p. 125. 13 Aryeh Kaplan, op. cit., p. 76. 14 Baigent, op. cit., p. 25. 15 John Hagee, Daniel to Doomsday, 153. 17 Baigent, op. cit., pp. 26-27. 18 Baigent, op. cit., pp. 104-105, emphasis supplied. 19 As quoted in Eden, op. cit., pp. 424-425. 20 While WLC promotes and uses the true names of the Father and the Son, those who thus interpret Scripture in this manner rarely, if ever, use the holy names. Thus, the Bible texts are quoted as used by the preachers who promote the belief in a return to Jerusalem and a rebuilding of the temple. 21 Ellen G. White, “Signs of the Times,” February 19, 1894. 22 To read more of the document, see: http://www.leaderu.com/ftissues/ft9405/articles/mission.html. 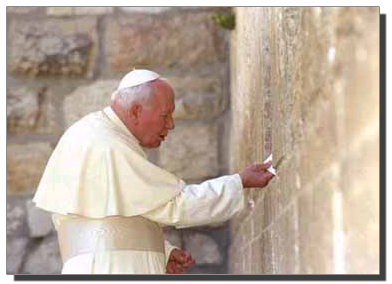 23 Mitchell Bard, “Pope John Paul II’s Pilgrimage to Israel,” http://www.jewishvirtuallibrary.org/jsource/anti-semitism/jp.html, emphasis supplied. 24 John Thavis, “In sign of respect to Muslims, pope prays in Istanbul's Blue Mosque,” Catholic News Service, November 30, 2006. 25 Phillip Pullella, “Pope book says Jews not guilty of Jesus Christ’s death,” Reuters, Vatican City, Wednesday, March 2, 2011. 26 Pugh, Eden, op. cit., p. 254.